I really appreciate the forum you have here and already spent countless hours looking through the threads about which gear to buy and which bags fit best on the s1000r. BUT I don't even have the bike yet! I'll buy it next week. It's my first bike. My first buy and my first everything, so please bear with me. I've also come across some demo models which are for sale. Are they a good deal or especially high risk because idiots rev them up while the engine is still cold? Who has bought a used s1000r before (2017 model preferably). When do you first have to deal with things breaking etc? How does the guarantee of BMW hold up to certain issues? In Germany we have a two year guarantee from BMW but I'm not sure what it covers. I'm really looking forward to becoming a REAL member of this community. Like any vehicle, buying new, you will encounter a substantial drop in value the minute you drive it off the lot. I have bought both used and demos over the years and had success. I have only ever owned 2 new bikes. 1 being my 18 S1KR. Demos sold by the dealership carry a decent warranty. You could also buy the extended for piece of mind. In my experience...so far , I've have nothing negative to say regarding their warranty. Had 1 issue (water pump) it was changed out without argument. If you are buying a used motorcycle and not confident to inspect it yourself, its worth the $ to have it done by a reputable mechanic. You can get some good bargains buying an approved used bike. I bought a 2017 approved used S1000R from a BMW dealer last September for £9000. 17 months old, 4k miles, HP forged wheels and came with a full 2 year warranty. I haven't ridden it yet as I don't ride in winter, but always cheaper buying off season. I will be putting it on the road at the start of April so looking forward to it. As long as it comes with warranty, there is not a lot to worry about buying used, especially from a BMW dealer. Congratulations my man! That's a fantastic price! The cheapest one in Germany is 12k€ with 30000km on it from a dealer and 12k€ and 3000km from a private seller. Where do you guys look for in the UK? Online? Whats the best time in the UK to visit with a motorbike btw? I was planning to stay for 2-3 months but haven't decided which months and where exactly yet. Is the S1000R in the UK also restricted to 9900rpm the first 1000km? I'm definitely not confident to inspect it myself. I have too little experience. My biggest issue is the neglectable price difference from used/new. In Germany there's no 2017 model under 10000km from a dealer for less than 13k€. Is there any difference between the 2017 and 2019 production lines? In the UK BMW dealers offer approved used cars and bikes with full BMW warranty and dealer back up, so that is the best place to start. 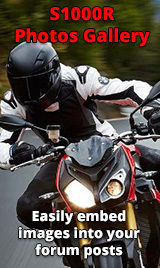 I found mine on ebay (UK), there are quite a few BMW dealers advertising on there. Here is a 2018 with 882 miles from a BMW dealer for £9900. In the UK, my riding season is April to September, but it is hard to say which are the two best months as our weather is too unpredictable. You will get good days and bad days. The dealer I talked too said there's no way to find a white 2017 model for under 13.5k€. And my research seems to confirm that. On ebay.co.uk there's really a lot of sellers and offers which look really attractive. On ebay.de there's only a single one which again is not great. Isn't it weird that a German bike is cheaper in the UK? Do you guys also have the Euro 4 standard or is there any other reason which might justify a lower price?